I ship A+H and N+H. 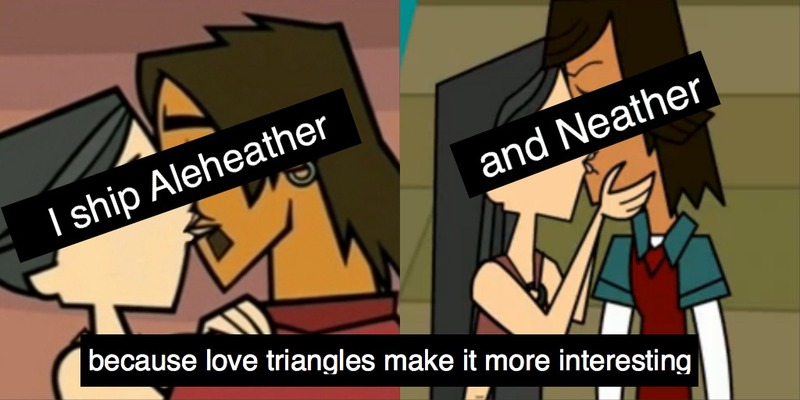 But I blame shabiki fiction for making me upendo Neather.. HD Wallpaper and background images in the Total Drama Island club tagged: total drama island aleheather neather. why is she kissing Noah?????? @TDrocksand6teen: It's actually from the scene where Heather kisses Trent, but someone colored it to be Noah. Wow. Over 50 views. Thanks! I ship AleHeather. Neather...not that much .-. Since when did heather kiss Noah?? It was fan art. And before Season 2, many people either shipped Heather and Noah or Heather and Justin on fan fiction. Agh I disagree love tangles are stupid and un interesting. I saw the last one and i didn't like it.